Imaging plays an important role in healthcare. Modern imaging techniques, including X-Rays and Ultrasound, can quickly show structures inside the body in great detail. We bring the radiology office straight to you. With a doctor’s order, whether the patient is at home or in a facility, our portable equipment is able to perform the exams at the bedside. Mobile X-Ray’s top-of-the-line equipment provides 100% digital images that can be viewed instantly on a laptop; our software allows the technologists to confirm on the spot if it is a good image. We can then present crisp, optimal imaging for interpretation by our team of Board-certified radiologists, and physicians can view the images online through our 100% HIPAA-compliant PACS portal. We offer complimentary burning of images to CD, STAT reporting complete with phone call from staff, and faxed reports sent directly to your facility, home health agency, or physician’s office the same day exam is performed. Our X-Ray services are available 24/7/365, and we provide Ultrasound exams 7 days a week from 8 a.m. to 6 p.m. Mobile X-Ray of Austin provides X-Rays for all body parts. Chest X-Rays are commonly used to diagnose pneumonia, infiltrations, congestive heart failure, and other abnormalities. In case of a fall or injury, shoulder and arm, ribs, or hip and pelvis exams, along with images of legs and knees are done to rule out possible fractures. Using a single imaging plate for X-Rays greatly reduces exam time and discomfort for patients, along with providing faster results. Other companies may use “digitized” radiography, where an imaging plate has to be developed in another location. Our digital X-Rays provide the best possible images for the radiologist to read – in the least amount of time. Medicare is requiring all-digital equipment to be used in the next few years, but we’ve been digital since 2008. Ultrasound services we offer include Venous Doppler, Arterial Doppler, Abdominal Exams, Thyroid Exams, and Renal Exams, among others. 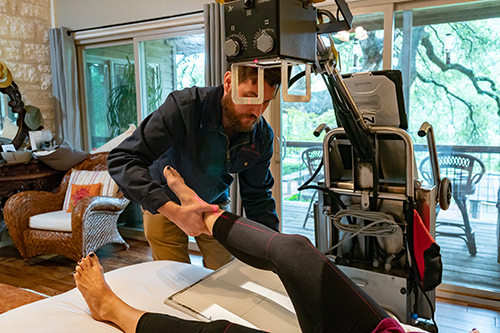 Non-invasive, safe and painless, our ultrasound equipment uses high-frequency sound waves to produce moving images of the soft tissues of the body onto a screen. There is no ionizing radiation used, and it does not require the injection of a contrast medium (dye). An electrocardiogram (EKG or ECG), which measures the electrical activity of the heart, is a quick, safe, and painless test. Physicians can use them to check heart rhythms, see if there is poor blood flow to the heart muscle (ischemia), diagnose a heart attack, or check on abnormalities such as thickened heart muscles. If your patient complains of being light-headed, having palpitations, or passing out, an EKG would be a good first test to run. Bear in mind that initial EKGs may be normal even if heart disease is present, so several EKGs over time may be needed to find an abnormality. Our PACS service allows for viewing a complete history in one easily-accessed site.